We are a small but successful lawn bowling club in the leafy suburb of Fairfield, Victoria, established in 1913 and with a proud history behind us we are still going strong. We have a proud reputation of being a club that prides itself in being small and a bit “quirky”. New members and guests will find us a welcoming club where players of all abilities are equally at home. Not only do we bowl together but we socialise together. We pride ourselves in our support for each other and celebrate and commiserate as a club. Competitive Bowls are played against other clubs. Why not join us to get a chance to play a social but competitive sport? Do you fancy a game where both you and your partner and/or family can play together? 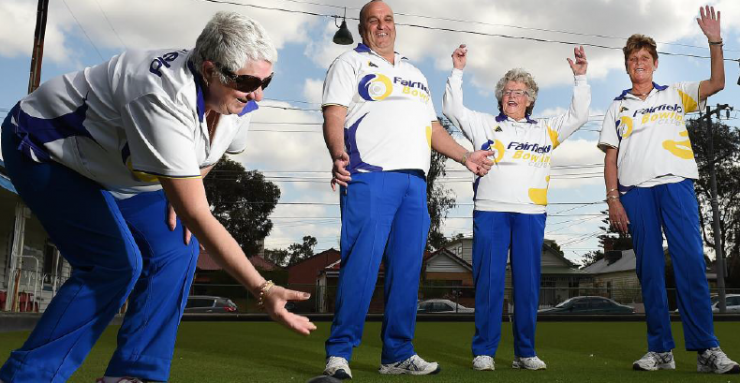 Did you know that bowls is an open-gender sport and is available for players of all ages? Fairfield offers teams on Saturdays and Tuesdays over the summer months plus has some weekday evenings on offer. Don’t feel that you need to be an expert player to start as we can offer coaching and a chance to find yourself in an appropriate division. If you would like to learn to play bowls and have lots of great laughter and fun doing it, phone the club on 9489 3145 and leave a message or Contact us for details or call into the club when you see members playing or working. Nelson Alexander are proud to support our club and will pay a contribution for all new business generated from our members & friends. Complete the details through the form below if you would like to arrange a no obligation sales or rental appraisal. Enter your email address to subscribe to club news and match reports.